This hardy perennial herb is easy to grow and can be planted with flowers, vegetables or other herbs. 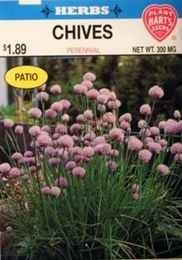 Use as a border or in pots, either indoors or outside. The thin, green tube-like tops have a mild garlic flavor and are used for flavoring salads, soups, stews and stir-fry. Grows well in a sunny or slightly shaded location. When plants are 4 inches tall, cut outer leaves near ground with scissors, use fresh or frozen. When in flower, the lavender colored blooms make a decorative border.